Seventeen students have earned their A.A.S. degrees in Medical Laboratory Technology this spring. Job prospects in their field are strong. West Windsor, N.J. – Two major professional organizations have rewarded students studying Medical Laboratory Technology (MLT) at Mercer County Community College students (MCCC) for excellence. Student Lisa Kimball is the recipient of one of only two scholarships awarded statewide by the New Jersey chapter of the American Society for Clinical Laboratory Science (ASCLS-NJ), which announced the winners during its annual Spring Seminar and Expo April 20. 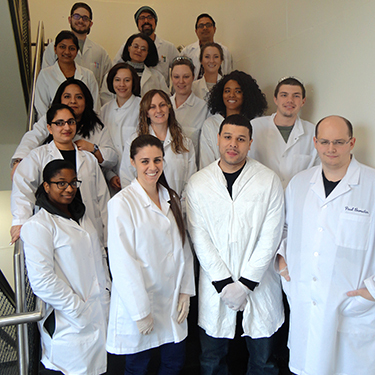 Additionally, six MLT students were recognized by the American Society for Clinical Pathology (ASCP), the world’s largest professional organization for pathologists and laboratory professionals and the agency that oversees the MLT certification exam. MCCC’s Pijush Mallick was selected as one of ASCP’s Top Ten National Student Honor Award recipients for 2017. Also receiving certificates were Lisa Kimball, Kyle Richardson, Magdoulen Sawires, Sapna Rai, and Nicole Napolitano. In addition to receiving a certificate, Mallick will receive a Board of Certification (BOC) Study Guide of his choosing. According to Shave, the ASCP’s selection criteria are rigorous, based on academic achievement, leadership ability, community activities, professional goals, and endorsements from faculty and community leaders. Shave says Mercer's MLT program is sending out well-prepared graduates who are ready for a variety of laboratory settings. "Our pass rate for students who take the ASCP's BOC exam for Medical Laboratory Technicians is 91 percent over the last three years." Job propects are bright for these grads. According to Bureau of Labor statistics, employment for medical laboratory technologists is projected to grow 14 percent through 2024, much faster the average for other occupations. Salaries are competitive, with averages ranging from $30,000 to $50,000. Shave notes that most companies hiring MCCC graduates offer sign-on bonuses as well. Among the work settings for medical laboratory technicians are hospital laboratories, physicians' office laboratories. public health clinics, blood collection facilities, reference laboratories, pharmaceutical firms, research institutions, manufacturing companies, and more. Copyright © 2017, Mercer County Community College. All Rights Reserved.